Elvis Multi-Strike is an online video slot machine game from IGT (International Game Technology) that has been released in January 2008. This online video slot machine game has 5 reels and 60 pay lines. The theme of Elvis: Multi-Strike is inspired by the life and music career of the “King of Rock and Roll”, considered to be one of the most popular musicians in the 20th century. Why the slot game is called Multi-Strike is because you can strike it big with this game. The Multi-Strike feature means you are playing with 3 sets of reels. All wins made on the 2nd level are doubled, while all wins made on the 3rd level of reels is quadrupled! To enable all the 3 reels, you must play at least 41 pay lines. You initially spin the bottom level, and if you have at least one winning combination there, the 2nd level of reels spins, where any wins are doubled, and then you move on to the 3rd level where any wins are quadrupled! You will not progress onto the next level if you do not form a winning combination, but you will not lose any of the wins you’ve gotten on the previous levels. You win the top award of 10,000x your line bet when you get the King’s name, ELVIS, to appear in sequence across the reels on any one of your active pay lines! It is only normal for many online slots players to try out the free play mode first whenever they happen to come across a slot game they have never played before. The reason for this is that they would like to evaluate whether or not that a particular slot game is worthy enough to spend real money on. Fortunately, you can play online slot games powered by IGT absolutely for free, without the hassle of downloading anything! Have a great time playing this game and enjoy the great rock music of Elvis at the same time with Elvis Multi-Strike online slots! Elvis fan or not, you will certainly love playing Elvis Multi-Strike as it features scatter symbols that activate different kinds of bonus features (Multi-Strike feature, Free Ride bonus feature, Rockin’ Re-Spin Bonus Feature, Photo Memories Bonus Feature), a Fan-O-Meter bonus feature, a Gamble feature, a top award of 10,000x your line bet when you manage to get the name ELVIS to appear in sequence across the reels, a whopping 60 pay lines, three sets of reels, and last but not least, it has a payout ratio! IGT offers only the best graphics and sound when it comes to their online slots games. In Elvis Multi-Strike, the background of the reels is a solid white, which makes a clean backdrop for the symbols. The outer surrounding of the reels presents the King himself, which shows images of him in different stages of his music career. Animated programming will be seen on the symbols when you get winning combinations. The overall graphic design of Elvis Multi-Strike shows many different colors such as blue, red, orange, yellow, purple, pink, green, brown and gold. When you spin the reels, familiar music from Elvis’ songs will be played. Different celebratory background music (still from Elvis’ songs) will fill your ears whenever you manage to hit winning combinations in this slot game, sometimes even accompanied by Elvis’ voice singing lines from his hit songs! In Elvis Multi-Strike online video slot game, there are no card deck symbols being used. Instead, the symbols used are the individual letters of Elvis: E, L, V, I, S, the TCB logo, and other symbols such as the Pink Cadillac, Teddy Bear, Graceland Mansion, Guitar, Microphone, and Elvis Presley himself. 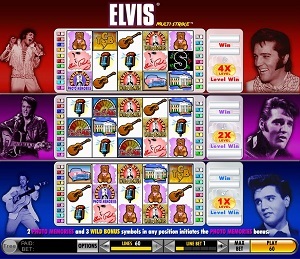 There is no Wild Symbol in the Elvis Multi-Strike online slot game. There are 2 Scatter Symbols in the Elvis Multi-Strike online slot game – the Photo Memories and the Wild Bonus scatter symbols. Scatter symbols mean that they do not need to appear in a line (on an enabled pay line) for you to win. These 2 scatter symbols can trigger any of the 5 different Bonus Feature games called the Free Ride Feature, Multi-Strike Feature, Scatter Award, Rockin’ Re-Spin Feature and the Photo Memories Bonus Feature game. Please take note that if you manage to obtain a scatter win and a regular win, you will be paid out accordingly for both of these wins, because the scatter symbols are not required to come out on an active pay line for you to win. Scatter wins are included to the pay line wins. Please take note that with the deck of cards, you have a 50-50 chance of unveiling either a black or red ace with every pick. Even if the history of the last 10 outcomes (black, red) is also shown, each card selected is entirely independent. Free Ride Feature – The Free Ride Feature is earned when you get any winning combination of 3 Photo Memories and/or Wild Bonus symbols, in any location on the reels, but only if the higher level is activated. For instance, 1 Photo Memories symbol and 2 Wild Bonus symbols in any location on the reels activates the Free Ride Feature, as does 3 Wild Bonus symbols. Multi-Strike Feature – With the Free Ride Feature, you can go up the levels even further by getting any 3 Photo Memories and/or Wild Bonus symbols. Also, if you get 2 Photo Memories symbols on the 1st and 2nd reels, you will activate the Rockin’ Re-spin Feature, wherein the first 2 reels “hold” while the others will re-spin, giving you more free chances to unlock a Bonus Round Feature! Scatter Award Feature – If you get a winning combination of a total of 4 Photo Memories and Wild Bonus symbols (in any position on the reels), you will be given a Scatter Award of 3x the total level bet, times the level Multiplier. For instance, 2 Photo Memories symbols and 2 Wild Bonus symbols in any location on the 5 reels awards you a Scatter prize, as does 1 Photo Memories symbol and 3 Wild Bonus symbols. Rockin’ Re-Spin Feature – If 2 Photo Memories symbols come out on the first 2 reels of any level, you will activate the Rockin’ Re-Spin Feature. The first 2 reels will “lock in” as do any other reels with the Wild Rockin’ Re-spin symbols. The rest of the reels are re-spun. Provided that an additional Wild Rockin’ Re-spin symbol comes out, it will also “lock in”, and the Rockin’ Re-spin Feature carries on. The Rockin’ Re-spin Feature will end when a re-spin occurs without a new Wild Rockin’ Re-spin symbol. Photo Memories Bonus Feature Game – If you get 2 Photo Memories symbols and 3 Wild Bonus symbols, you will activate the Photo Memories Bonus Feature game. In the Photo Memories Bonus Feature game, push the Spin button to start an arrow to spin on a record surrounded by a number of Elvis’ photos. The arrow will stop and award a Photo Value, which is based on the total bet on the reel level that triggered the Photo Memories Bonus Feature game. The photo will be replaced with a Collect symbol once it is put into the photo album at the bottom of the game screen. As the bonus game continues, extra arrows are added (up to 8), and the values of the photos increase. However, whenever you collect photos, more Collect symbols are added to the record, and if an arrow points to a Collect symbol, the Photo Memories Bonus Feature game will end. Fan-O-Meter Bonus Feature Game – If you get 3 Fan-O-Meter symbols on any enabled pay line, you will activate the Fan-O-Meter Bonus Feature game. Select 1 of 5 televisions, each of which contains a certain Elvis song. The game will then show you a concert footage of Elvis performing that song. During the song, the audience will produce a celebratory frenzy at different points in the song. At the left part of the televisions, the needle of the Fan-O-Meter will move about, showing how strong the response of the audience is – the louder the cheers, the higher your pay! In case the audience gets to “Peg The Meter” at its top spot, you will be awarded with an Encore, which means you get to pick another remaining Elvis song for an extra award! Up to 5 Encore concert footages may be shown to you. Elvis Multi-Strike has 5 reels where you may bet on as many as 60 pay lines. The minimum bet is 1p up to £5 per pay line. You can wager from 1 up to 5 coins per pay line bet.